Beyond Madaya, 1 in 3 Syrians Doesn't Have Adequate Access To Food : The Two-Way Starvation has been a weapon of war for multiple parties in the conflict. Even in areas not under siege, it's harder for civilians to afford basic food items, with prices dramatically inflated. People wait to leave the besieged town of Madaya, northwest of Damascus, Syria, on Jan. 11. The village of Madaya, where civilians died of starvation during months of siege by government forces, isn't the only place in Syria where people can't get enough food. Before aid convoys arrived in Madaya on Jan. 11, at least 23 people in clinics died of starvation, Doctors Without Borders reported. The village, which is near Syria's border with Lebanon, had been surrounded by gunmen loyal to Syrian President Bashar Assad for six months, and food aid was blocked from October until the aid convoys arrived. Madaya is an extreme example of a widespread problem inside Syria: food insecurity. Supply lines are cut because of fighting or siege, agriculture is impacted by the war, and the cost of food has soared. Even after aid convoys arrived in Madaya earlier this month, five people died from malnutrition, the United Nations reports. 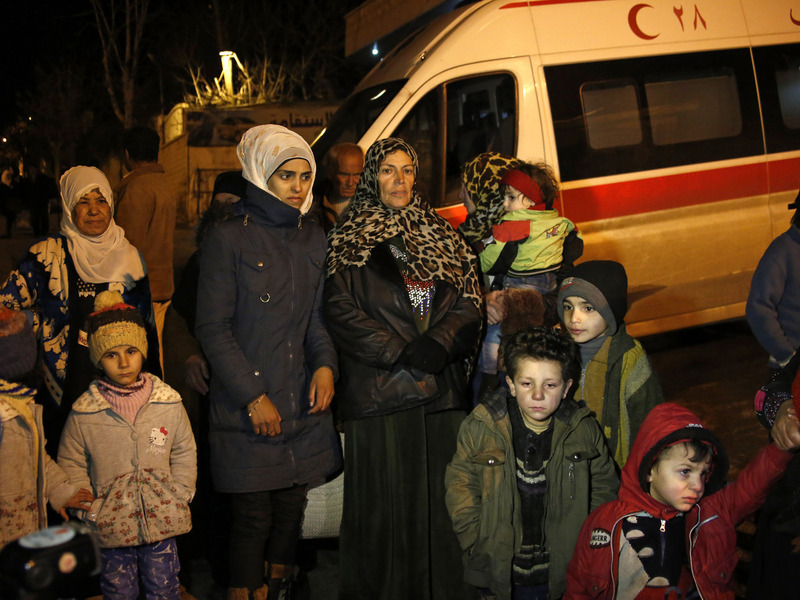 Now, "dozens of individuals need immediate specialized care outside of Madaya if they are to survive," the U.N. says. "In weeks preceding the initial humanitarian convoy, many essential food items were either unavailable or unaffordable because of inflated prices," community members told the U.N.
As NPR's Alison Meuse reports to our Newscast unit, "Photos posted online by activists show residents offering their cars in exchange for baby milk." Siege is being used as a weapon of war by multiple parties to the Syrian conflict. Another siege, this time by ISIS militants, is raising concerns about starvation. Some 200,000 people — 70 percent of them women and children — are trapped in the western side of Deir ez-Zor, close to the Iraqi border, according to a U.N. report. The U.N. says it received unverified reports that 15-20 people in Deir ez-Zor died from starvation in 2015. "While government stocks continue to provide bread, there are very limited supplies in the city as there has been almost no humanitarian or commercial access to the city," a U.N. report says. Supply disruptions are driving up prices in many places. For example, rice was reportedly selling for $93 per pound in Madaya before aid arrived. By comparison, the latest World Food Programme report said rice was selling for 31 cents per pound in Syria's capital, Damascus. These price maps, broken down by region, show the impact of cut supply lines and siege on the cost of basic goods. Across the country, prices of staple goods have soared since the start of the war. As the World Food Programme reports, "compared to pre-crisis ... the price of wheat flour and rice rose by 388 percent and 723 percent respectively." One in three Syrians "do not have adequate access to food," the World Food Programme said in a 2015 report. It's been nearly five years since the conflict began in Syria. A 2014 report by REACH, a humanitarian analysis group, said the most common coping strategy was using savings or borrowing money to buy basic food items. But that can only last for so long. "Unemployment and rapidly rising inflation make food significantly less affordable, even when it is available," the World Food Programme says. "In some cases, substantial amounts of wheat (the main staple of the Syrian diet) have had to be stockpiled, because farmers have not been able to sell or transport them. That means that markets in parts of the country will not have sufficient stocks to meet demand, consumers will not have sufficient access to the wheat they require to feed their families, and both rural and urban livelihoods will be further stressed."